Where do the social profiles come from? Control whether you link your users to social media profiles. We use a third party service called FullContact to enrich the user profile view. Given a user's email address, FullContact will return publicly available social profiles. These are shown by small icons next to the users name on the user profile page. In addition, Twitter followers can be shown on the user list page, allowing you to sort and filter by follower count. Note: Social profiles data doesn't always appear immediately. It can take up to 24 hours to populate. FullContact will return the users name if they have it. If you use message variables to add the users name in your auto-messages we will first try to use the name you provide us in your intercomSettings script. Based on the FullContact data, we then fetch avatars from Facebook, Google+, Twitter, and Gravatar that match. If we can't find an avatar, we will generate a generic custom one for that user. 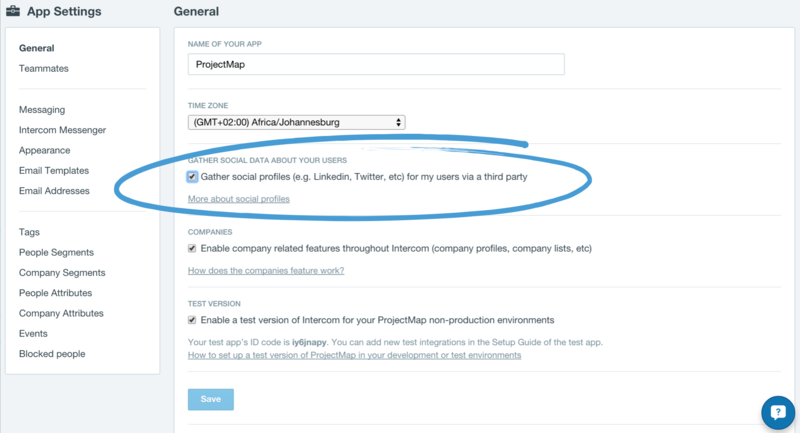 Important: If you don't want us to gather social data about your customers you can turn off this option in your app settings.